The Mucha Collection of silver rounds from Anonymous Mint and The Mucha Foundation already represent one of the most diverse silver offerings on the market right now. The collection continues to expand with the addition of colorized versions of each of the popular designs in the collection. 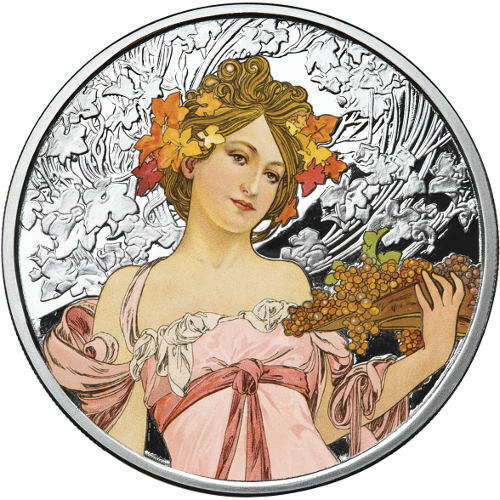 Today the 1 oz Proof Colorized Silver Mucha Collection Champagne Round is available to you online at Silver.com. Fourth design in the Mucha Collection! Concepts from Julie Lindquist with engravings from Luigi Badia. Reverse includes the image of Alphonse Mucha. Obverse bears the portrait of Champagne. All of the 1 oz Proof Colorized Silver Mucha Collection Champagne Rounds available here today feature a beautiful proof striking with a mirrored finish to the background. The addition of colorized finishes to the round brings his original Champagne design to life. All rounds in the collection have edge lettering with individual serial numbers, which are reflected on the Certificate of Authenticity included in the purchase of every round. 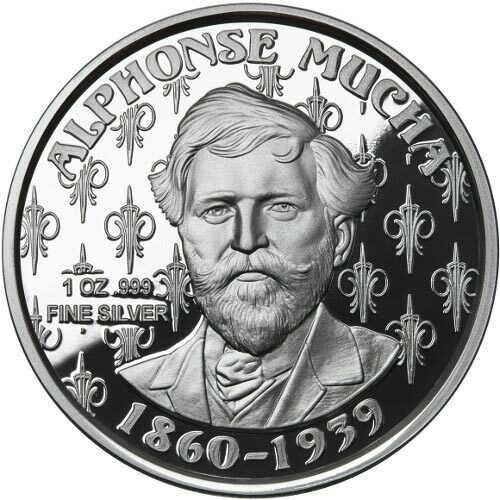 The reverse of each of the Mucha Collection Silver Rounds includes a portrait of the artist himself. Mucha was born in present-day Czech Republic, then the Austrian Empire, in 1860 and would launch his artistic career in 1895 with an ad sketch for a local playhouse. He was active in the arts until his death in 1939. On the obverse of all 1 oz Proof Colorized Silver Mucha Collection Champagne Rounds you’ll find the beautiful image of Champagne. Her figure was used by a prominent champagne company that Mucha worked for designing catalogs, posters, and other advertisements. She is depicted as a sensual blonde with a long, pink dresses that exposes her shoulders. Grape vines frame her figure in the background as she clutches a bowl of grapes in her left hand. Anonymous Mint is producing these silver rounds with the blessing of The Mucha Foundation. Julie Lindquist is behind the concept for the six-round program, with Italian Master Sculptor Luigi Badia rendering the images on dies for casting. Please don’t hesitate to contact Silver.com at 888-989-7223 with questions. You can also reach out to us online through our live chat and email features.